Click the link below Crueheads…. 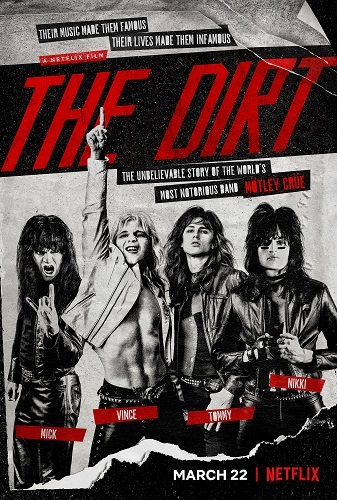 That’s how I felt a number of years ago after reading The Dirt: Confessions of the World’s Most Notorious Rock Band the 2007 biography of exploits as written by the members of Motley Crue. That tell-all has come to the small screen. The biopic, just released (March 22) by Netflix, hardly provides the same effects but captures the essence of the book with all of its smutty sensationalism. The drugs (lots). The women (lots). The music. All of it. Even the reported scene when Ozzy Osbourne snorted ants poolside at a hotel while on tour. No worries Sir! Great writeup! I still have not watched. Instead I’m watching the 1990 MuchMusic special called “Decade of Decadence” which, copyrights notwithstanding, I would like to post ASAP. Link it here Sir if u like! I see the update – glad to hear you’ve now seen it! It was a lazy afternoon Geoff so I sat and watched it. Considering it was full of bad wigs and somewhat debatable acting and I think its safe to say some embellishment at times as well as kooky at times I dug it. A pleasant experience watching a trianwreck before my eyes! Thanks to Drew for the review which between his and Bops got me to watch..
Monday I will post the review of the Soundtrack! World’s most notorious rock band? Hmmm. Could be debated.